At its annual fall event for 2017, Apple unveiled the iPhone 8 and iPhone 8 Plus. 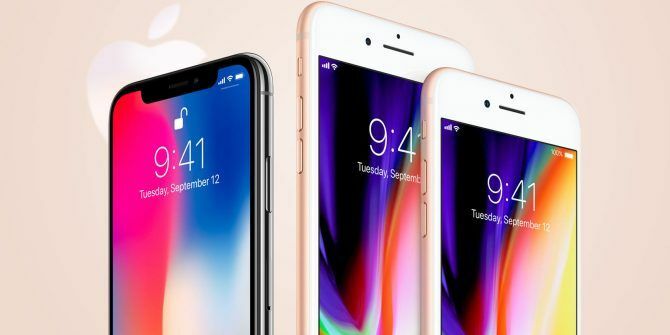 These two phones were, however, somewhat overshadowed by the unveiling of the iPhone X Apple Announces iPhone X & iPhone 8: Everything You Need to Know Apple Announces iPhone X & iPhone 8: Everything You Need to Know What's so special about the iPhone X? Can you really justify the $999 price tag, or is the refined iPhone 8 a better buy? Read More . The latter is the new, forward-looking, premium product Apple thinks is worthy of a whopping $999 price tag. The iPhone X isn’t being released until November, with pre-orders starting in October. Which means tech reviewers are focusing first on the iPhone 8 and iPhone 8 Plus. The first reviews have been published online, so we thought we’d digest the juiciest details from the early iPhone 8 reviews. The Verge reminds us that this IS an iPhone, and a very good one at that. However, the iPhone 8 isn’t the iPhone X, and therefore “it’s not the future, and it’s not the cutting edge”. It is, instead, “just the default”. Therefore, Nilay Patel “can’t think of a single compelling reason to upgrade from an iPhone 7”. Engadget describes the iPhone 8 and iPhone 8 Plus as “familiar-looking phones that mostly operate the way people expect them to”. In other words, “they’re conventional”. Chris Velazco calls the iPhone 8 an “incredibly powerful machine” which will appeal to “fans who want a blend of classic Apple style and top-tier performance”. But again, it’s no iPhone X.
TechCrunch focuses on the camera of the iPhone 8, with smartphone cameras 8 Phones With the Best Cameras Today 8 Phones With the Best Cameras Today With advancements in hardware and a demand for multi-function devices, smartphone cameras can indeed replace standalone cameras. Read More being the focus of Apple’s attentions. Unfortunately, Matthew Panzarino suggests that the iPhone 8 “sits in the shadow of the iPhone X”. However, “a bunch of internal upgrades and a nice new glass back” make the iPhone 8 “the easy traditional choice this year”. Wired describes the iPhone 8 and 8 Plus as “virtually perfect phones” which do everything required of them. However, they’re “already obsolete” as “the iPhone X looms large over the 8, with its tiny bezel and Face ID and amazing cameras”. Which leads David Pierce to suggest that “if you want to be part of the future, save your money for now”. Mashable claims that while “the iPhone 8 and 8 Plus are meaningful upgrades for many of Apple customers […] they should have been called the iPhone 7S and 7S Plus.” So Lance Ulanoff is happy to advise anyone who owns an iPhone 7 or iPhone 7 Plus Everything You Need to Know About the iPhone 7 & iPhone 7 Plus Everything You Need to Know About the iPhone 7 & iPhone 7 Plus No headphone port, water and dust resistance, and Apple's best camera yet -- this is the iPhone 7. Read More to “save up a few more bucks and wait for the iPhone X when it ships in November”. Someone somewhere in MakeUseOf Towers is probably working on an iPhone 8 review. However, in the meantime, our peers have spoken, and declared that as good as the iPhone 8 and iPhone 8 Plus are, they’re forever destined to be overshadowed by the iPhone X. Which is a bit of a problem. What do you think of the iPhone 8 and iPhone 8 Plus? Are you likely to buy one? If so, which? Or are you going to hold off and splash out instead on an iPhone X? What has convinced you the iPhone 8 or iPhone 8 Plus is the way to go? Please let us know in the comments below! Explore more about: Apple, iPhone, iPhone 8, Online Reviews. The iPhone 8 and 8plus are obviously going to be overshadowed and not just by the iPhone x but also by all other flagships released this year. In my opinion, I think apple for once is providing 'budget' phones for its customers. Nonetheless, I see no good reason to upgrade from a 7 or a 7plus to an 8 or 8plus. I have an Iphone 5S - should I upgrade to Iphone 8/plus? Apple was supposed to make available Iphone X 6gb Rom 512gb,but it must have fell off somewhere.